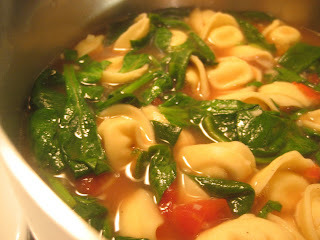 I can't say enough about this simple soup (from Fine Cooking #47) made with stuff you can buy at a regular grocery store (like bagged washed spinach, frozen tortellini, canned tomatoes and broth.) There's a good amount of garlic in here and it just transforms store-bought chicken broth into something fresh tasting. This soup has become a staple in our household. I've talked about it before but never given the recipe. So here it is. Please buy good tortellini for this. If you are in Chicago, the ones from Dominick's, the Safeway brand, are just awful. They're gummy and you won't be happy with your soup. The Contadina brand (from supermarkets, (here in Chicago)) are somewhat better and Whole Foods carries a Perfect Pasta label (in the frozen case) that is great. You could do mushroom tortellini here, or of course, some sort of chicken tortellini would be good. Pretty much anything that sounds good to you would work. We always just do cheese tortellini though. This recipe is easily made vegetarian with veg. broth. If you're going to buy broth, you'll need one of those big box cartons. 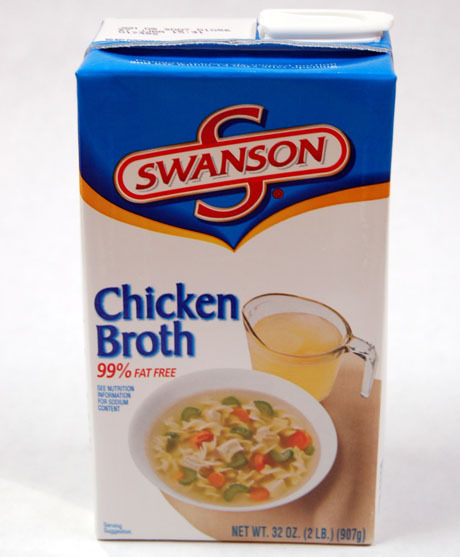 I recommend Swanson, low-sodium, Healthy choice chicken broth. Looks great, Can you post the recipe? 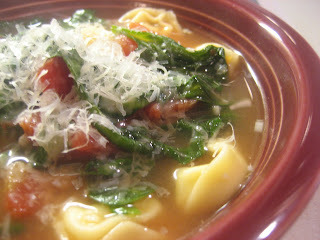 The recipe can be found at the link "here"
I keep saying I'm going to make this. Everyone on CooksTalk seems to love it. This looks great. I'm buying tortellini and spinach today! A nice, quick thing to whip up and take to work for lunches. Hope I can find some decent tortellini.